Have you ever wondered what it would be like if a middle class Victorian lady left her tea parties and English gardens for back-breaking farm labour in the wild Canadian backwoods? 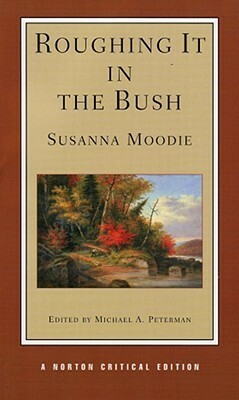 Susanna Moodie’s famous journal Roughing it in the Bush (1852) chronicles her personal experience of such an adventure (or misadventure, as she has few kind things to say about Canada for much of the book), as she forsakes her comfortable English life to live in a dilapidated shack in the middle of the forest and learn how to hoe potatoes, paddle a canoe, bake her own bread and milk a cow (although she never quite masters the latter). The trials the Moodie family experience while living in the bush are severe. One extremely poor harvest forces them to eat rotten potatoes and wheat and trap squirrels for food. Not surprisingly, serious illnesses visit their little homestead frequently. The appalling poverty, grueling physical labour and extremely isolating environment and climate of living in the backwoods of Canada would be enough to drive many to the brink of insanity. Indeed, the madness that the sheer, incomprehensible vastness of the Canadian wilderness often overwhelms people with has been a common theme in Canadian literature – but count not Susanna Moodie among the unhinged. Although she definitely endures periods of depression and sadness, gazing upon the Canadian landscape compels Moodie to reflect upon and praise the awesomeness of its Creator. How else does one survive the wilderness? From Moses to Isaiah to John the Baptist, God again and again reveals Himself as a living stream of water in the desert to those who thirst after Him. To live in the wilderness without God is to wander, lost, forever; to know God is to meet Him and experience His faithful mercies in that desert place, as Moodie’s journal testifies to.